What to Expect with our process. Wood floors and stairs are all that we do; therefore, you can expect complete focus on a great final outcome. 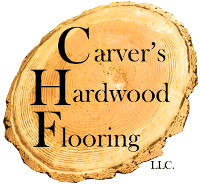 Whether your project consists of only a clean & recoat of your floor or a complete new floor installation, you can rely on craftsmanship from start to finish when you choose Carver’s Hardwood Flooring, LLC. You will always receive a personal assessment of your project from manager Ryan L. Carver along with a detailed estimate. You will also receive more than a decade of experience in all phases of the wood floor business. Ryan will personally be involved in each project giving you confidence the job will be done right; no shortcuts are ever taken. The first step is to hang plastic on doorways to contain dust within the work area. All equipment has dust collection attachments to reduce airborne particulates. The smaller equipment, which creates the finest dust, is connected to a vacuum with a Hepa filter. Trim is removed if necessary (this will be addressed in the estimate if it is required). Sanding will commence and will run through several grits of sandpaper with many passes being made. Not to worry, less than a credit card thickness is taken off, but working through the grits is needed in order to insure no sander marks are left in the wood. Before the final passes, all nail holes will be filled. This allows for any residual putty to be cleaned off of the wood by the final sanding pass before seal is applied. The floor will then be screened with a fine screen on a buffer. The floor, trim, and window sills will be vacuumed. Plastic will be removed from doorways, and the floor will be vacuumed again along with adjacent areas to doorways. A mineral spirit tack will be performed on the floor, and it will be allowed to sit for an hour in order for any airborne dust to settle. Tacking of the floor will be done more times to insure they are as clean as possible. The first coat of polyurethane seal will be applied and allowed to dry. The next day another coat of polyurethane seal will be applied and allowed to dry another day. After the second coat of seal is dry, it is a great time for the trim to be reinstalled and any doors to be hung. When you are ready, the floor will be screened again with a fine screen to smooth the grains of the wood and to get any scratches or scuffs out that may have occurred when installing the trim. A mineral spirits tack will again be used up to three times in order to completely rid the floor of dust. The first coat of finish is applied and allowed to dry. The next day the floor will be inspected to determine that it is indeed finished; if another coat of finish is felt to be necessary, it will be done with no additional charge. The first step is to deliver the flooring two to five days in advance of starting the project. This step insures proper acclimation to the environment the flooring will be installed in. When the scheduled installation time arrives, plastic will be hung in doorways to keep dust confined within the work area. Door jambs will be undercut to allow the flooring to slide under door trim for a nice finish. This step is sometimes skipped by some installers to save time, but skipping this step does not allow for a professional job. Rosin paper will be installed as a vapor barrier between the subfloor and the new flooring. One of the most important steps in the process is to square and straight line the new flooring to the room it will be installed in. After the flooring is squared, straight lined, and four runs are down and rechecked for square and straightness, the installer can then move on with the big nailer. At this point, the install process will move along quickly. Great care is taken in placement of the flooring boards to insure the floor is structurally sound. Also, boards that do not fit in with the whole theme of the floor, as far as color, grade, and quality are culled out. Thresholds will be fabricated to fit and installed as necessary. When finishing against a wall, the final three or four courses will not be able to be blind nailed. They are top nailed, and the nail holes will be filled during the sanding process. At this point, the sanding and finishing process will start. The process is the same for a new install as it is for a refinish, except a new floor does not need to be sanded as aggressively.